Julian Smith has qualified for World Junior Championships in Lahti, Finland. This is Julian’s third time qualifying (Kazakhstan 2015, Utah 1017)! The World Junior Trials for Canadian athletes were held December 13, 15, 16 at the Canmore Nordic Centre in Alberta. His sprint qualifier was 0.02 seconds behind the winner making him the top U23. A team of eighteen Canadians is going over to represent Canada: 10 U20s and 8 U23s. First they will train in Norway for 10 days with the new Canadian national coach Eric Bratten as well as legendary and recently retired national team member Devon Kershaw. The team will then go to Lahti and the racing starts Jan 20th. 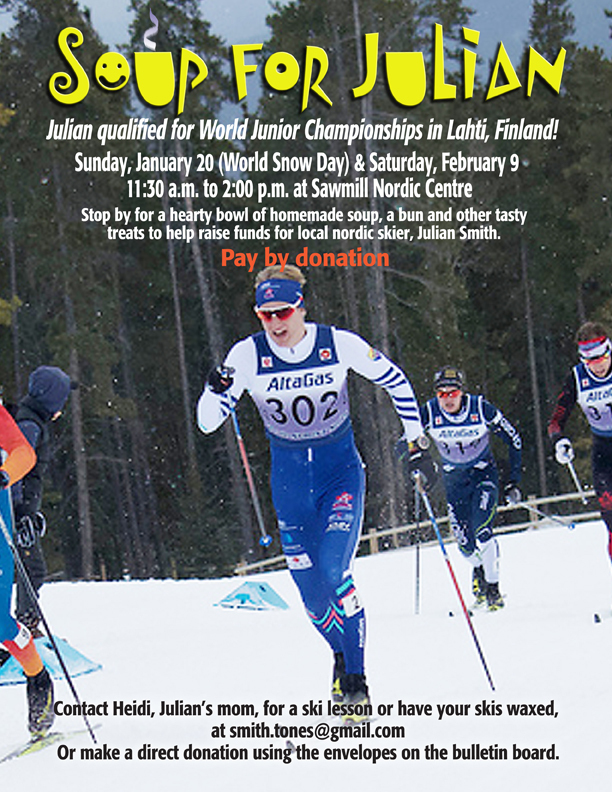 If you wish to support Julian we will be selling soup during World Snow Day on Sunday, January 20th as well as on Saturday, February 9th at the Sawmill Trails. The money raised will be used to cover race and travel expenses to Lahti, Finland.